UKIP Scotland describe themselves as “The Only Eurosceptic and Unashamedly Unionist Party in Scotland”. Other parties are clearly unionist (and presumably aren’t ashamed of it) so presumably the most important word in that claim is “and”. UKIP’s leading piece in their manifesto is about “Brexit”, the withdrawal of the UK from the EU. This goes alongside their opposition to immigration, including EU immigration. It is their UK-wide policy and for many, it’s the reason UKIP exists at all. Nevertheless, UKIP isn’t a single-issue party, and has set out its tax and spend proposals. higher rate of 40 per cent will begin at the threshold of £55,000. We might argue that the £970 saved by those earning more than £45,300 is not significant enough to swing the vote towards UKIP, but it does lay out where UKIP believes it wants to make a difference. Indeed they later explain that this new band should be just the starting point. UKIP believes that the Scottish Government spends too much. It proposes to cut the number of politicians and quangos and to restrict government borrowing. UKIP haven’t spelled out how much they propose to spend in any particular area. Although they support the NHS and the Scotttish education system, we aren’t told whether this means more or less money available. They do, however, propose to charge tuition fees to students from elsewhere in the EU, who currently receive their higher education free. UKIP believe business rates are too high. They don’t quantify by how much, but they believe that rates should be reduced as this would be a good thing for Scottish business. Similarly they would cut out swathes of regulation, particularly those that originated at the EU. Interestingly, UKIP wants to raise the permissible amount of alcohol in the bloodstream for driving and re-introduce smoking in pubs. This, they believe, will be good for people who enjoy a pint and a smoke as well as being good business for pubs. UKIP opposes plans to bring rural sporting estates into line with other businesses. Other parties have mostly, to some extent, advocated some degree of land reform in Scotland. This might be simply greater transparency in land ownership or it might be a tax linked to land value. Or it might be supporting community buyouts. UKIP is generally against any measures to reform land ownership, which they call a “land grab”. They believe in the right of inheritance to land, which the SNP is looking to reform. There really isn’t much in UKIP’s manifesto I can use for this blog. In many ways, their financial package appears to be to carry on as before, with the lowering by 10% of income taxes for middle income earners and an unspecified lowering of business rates. Their spending cuts look like they will target bureaucracy rather than services, but again no figures are provided. UKIP’s opposition to land reform will strike a chord with some, but momentum is already going away from them, and my own views have been repeated many times on this site (mostly around a land value tax). UKIP’s thrust is not really on the financial, other than to reject tax-and-spend policies. Their appeal is more likely to be on their anti-EU, anti-immigration issues. 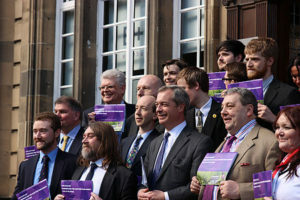 The full UKIP Scotland manifesto is available here.